Whether you're enjoying your morning coffee or hosting a seasonal garden party with friends, your outdoor living spaces are where you can relax and enjoy the landscape. Maintain the beauty of your outdoor furniture with this 3 piece Outdoor Deep Chair and Table Cover Set by Reusable Revolution! Each set includes 2 seat chair covers and a dining table cover that provide reliable coverage and superior protection from the rain, snow, ice, and extreme temperatures. Made of 100% woven polyester fabric, this weather resistant material is equipped with interlocking seams that add strength and staying power, easy pull string closures that keep the cover securely in place, and a refined and elegant style suitable for most modern and contemporary outdoor settings. Comes as a set of 2 deep chair covers and a table cover; The chair covers measure approximately 31.5 x 38.5 x 29 inches; the table cover measures approximately 72 x 45 x 26.5 inches. MAXIMUM PROTECTION - Made of weather resistant materials that are designed to protect your outdoor furniture from dirt, dust, mold, mildew, rain, snow, ice and extreme temperatures. Each cover is constructed of durable, yet lightweight woven polyester to thoroughly safeguard your furnishings from sunlight and moisture. 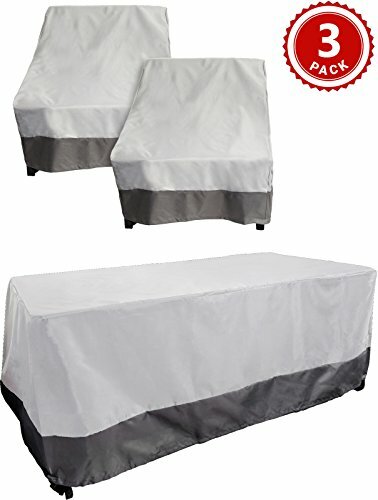 COMES AS A 3 PIECE SET - Protect your patio furniture in style! Each set includes 2 deep chair covers and 1 dining table cover, all in coordinating colors. SIMPLE TO USE - Drapes easily around outdoor furnishings and can be secured in place with discreetly-located pull string to prevent moisture from accumulating. When not in use, each cover folds neatly into the included storage bag. STYLISH - Featured in neutral tones, this furniture cover set is aesthetically designed to coordinate with most contemporary or modern outdoor settings. PRODUCT SPECIFICATIONS - Comes as a set of 2 deep chair covers and a table cover; The chair covers measure approximately 31.5 x 38.5 x 29 inches; the table cover measures approximately 72 x 45 x 26.5 inches. If you have any questions about this product by Reusable Revolution, contact us by completing and submitting the form below. If you are looking for a specif part number, please include it with your message.